Istanbul, 1481: The once great city of Constantine, a strange mix of Christians, Turks and Jews, now forms the heart of the Ottoman empire. The conquest, still a recent memory, means emotions run high; danger is never far away. Skiouros and Lykaion, sons of a Greek farmer, are conscripted into the infamous Janissary guards and taken to Istanbul. As Skiouros escapes into the Greek quarter, Lykaion remains with the slave chain, becomes an Islamic convert and guards the Imperial palace. But one fateful day Skiouros picks the wrong pocket and begins to unravel a plot reaching to the highest peaks of Imperial power... He and his brother are left with the most difficult decision faced by a conquered Greek: is the rule of the Ottoman Sultan is worth saving? The epic and unputdownable first book in S.J.A. Turney’s Ottoman Cycle, The Thief’s Tale is perfect for readers of Simon Scarrow, Conn Iggulden and Bernard Cornwell. 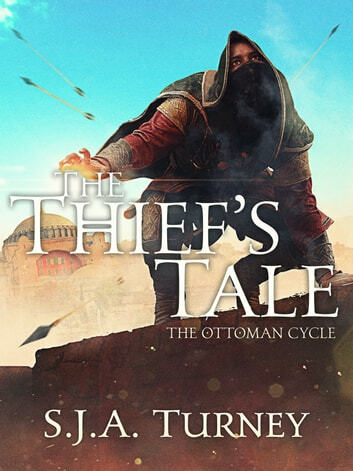 An Eastern tale about a young street thief and his brother based in an era of change from Christian rule to Islamic rule. an intersting plot based around true events. likeable characters, detailed story telling and ticks all the boxes for a historical fiction book. i'm hunting for the sequel now. you should read this if you like books on rome and crusades. Top read, well developed characters and gripping story. Very enjoyable. The picture on the cover looks like the thief had magical abilities and that is why I was drawn to it. Turns out that was not the case and the old proverb is true. Saying that it was a good read I liked it but not enough to rave about it. An unusual setting for a story with familiar elements which made for satisfactory reading. It was worth persevering through the bad parts to get to the end and find out what happened to the hero. This is an interesting period and so much less known than English history of a similar period. I was absorbed in the characters as well as the setting.